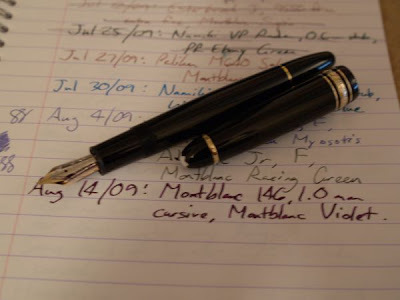 Here's my latest acquisition, a Montblanc 146 with a 1.0mm Minuskin cursive italic that I got in a trade with another FPNer. It's about what I was looking for - a broader italic in a body easier to hold for a long time than my VP. I look forward to showing it off in September! Nice acquisition, Graham! Looking forward to seeing the 146 in person in September. Our next meeting will be held on Thursday Sept. 17th at the Perks store on Cambie & 42nd in Vancouver. Time of meeting: 6:30pm ("Meet & Greet" at 6:00pm for the early birds). Theme/topic of meeting: to be announced.